September | 2012 | "It's All Greek to YOU!" 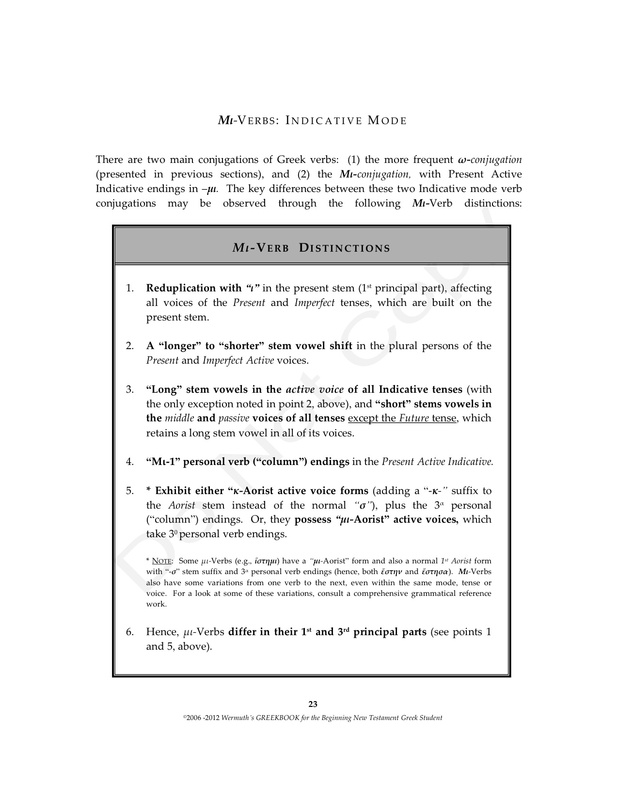 The verb tenses in Greek are divided into six basic “systems” called Principal Parts (“mouse-over” images, then click, and click again for enlarged viewing). Each system has a distinct verb stem, from which all the various tenses and their respective “voices” are built (first image). 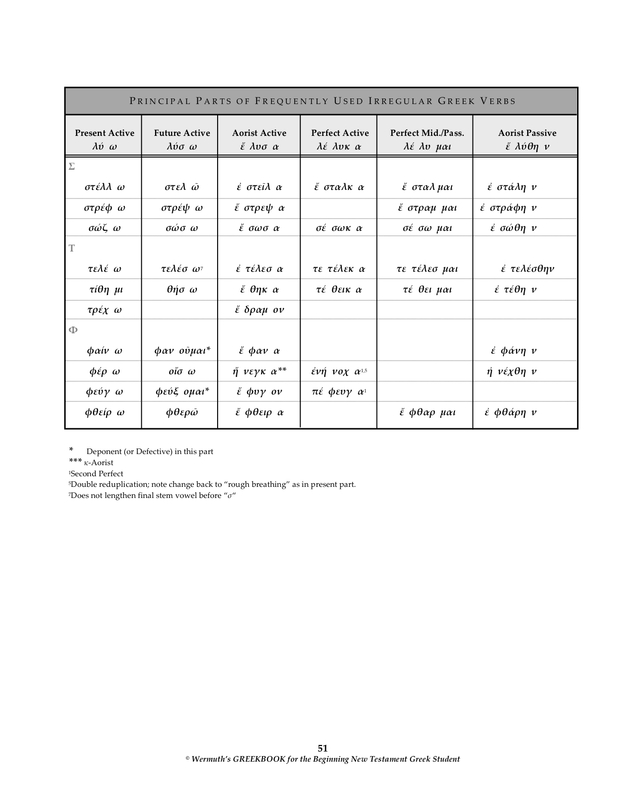 In order to recognize a Greek verb, it is necessary to be familiar with its principal parts.The “regular” principal parts system is represented by the normal, “model” Greek verb λύω. 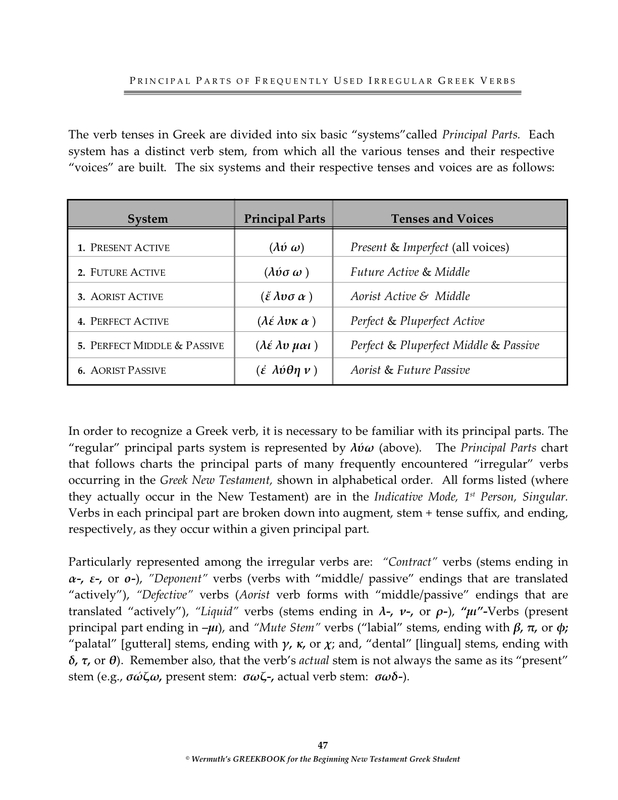 The Principal Parts chart represented within the above image files delineates in alphabetical order the principal parts of many frequently encountered “irregular” verbs occurring in the Greek New Testament. To view all the pages at full-page size or to download the entire PDF, click here or view/download anytime from the sidebar, opposite. I’ll Not Remain “Mute” About This! I’ll not remain mute about this. I’ll teach you something about “Mute Stem” changes (JPEG) within Greek verbs, so you won’t need to remain “mute” about the subject, either! As a New Testament Greek student it can be helpful in the “short run” (or longer) if you can visualize in your “mind’s eye” certain critical pieces of information. 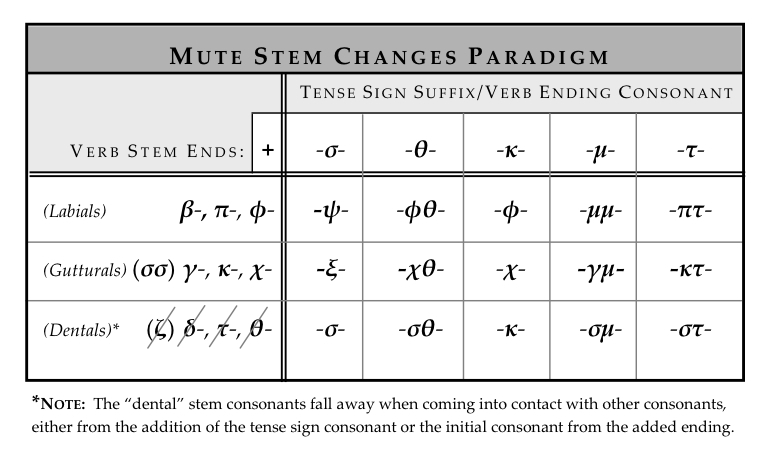 Some of that critical information is this: “What happens when certain Greek consonants collide with other Greek consonants, and why?“ Please read the following treatise on “Mute Stem” changes where, below the following chart, I will give you a fairly easy way to “set up this chart” in your mind. (1) Start reciting the Greek alphabet: α…β…γ...δ…then start writing the letters (vertically) as soon as you get to β, γ, δ. You now have the first letter of each of the three categories of letters. (2) Next, vertically write (with Greek letters) the first letters of the acronym:“preachers’ kids (are) terrific”…or…π, κ, τ. Now you have the second letters of each row. (3) For the final vertical row, add the Greek equivalent of an“h” to the letters you just wrote (π, κ, τ), resulting in: φ, χ, θ. 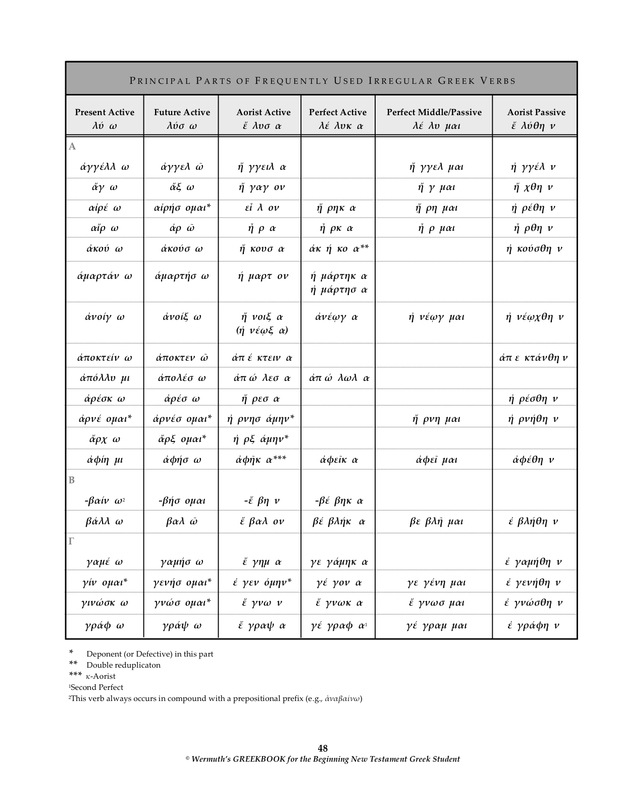 With this done, you can now more easily memorize the results of collisions with various consonants that occur. Don’t be intimidated by these “irregular” New Testament Greek verbs. If you pay attention, they too reveal structural “patterns” that you can find some comfort level in recognizing in context. 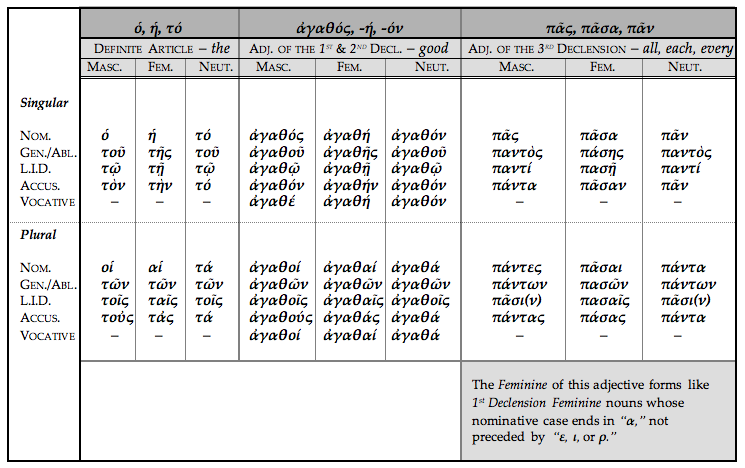 The primary “bottom line” characteristics of μι-Verbs are presented in the image below, and also as part of a downloadable PDF that includes μι–Verb Indicative Mode formation charts as well as a listing of the most frequently occurring μι-Verbs in the New Testament. Here’s a proven method for vocabulary card creation, study and mastery. It’s based on the principle, familiar to some, called “conditioning” (“conditioned reflex”). In the 1890s Russian psychologist Ivan Pavlov demonstrated a repetitive occurrence in the behavior of dogs when presented with food accompanied by an additional stimulus (e.g., ringing a bell). Each time the dogs were presented with food, evoking salivation, a bell was rung simultaneously. After numerous trials of food presentation, accompanied by a ringing bell, with consistent occurrences of salivation by the dogs, the trials were run the ringing without food being presented—yet the dogs continued to salivate in successive trials. This same “conditioning” principle is very effective in producing consistent memory results when studying Greek vocabulary. 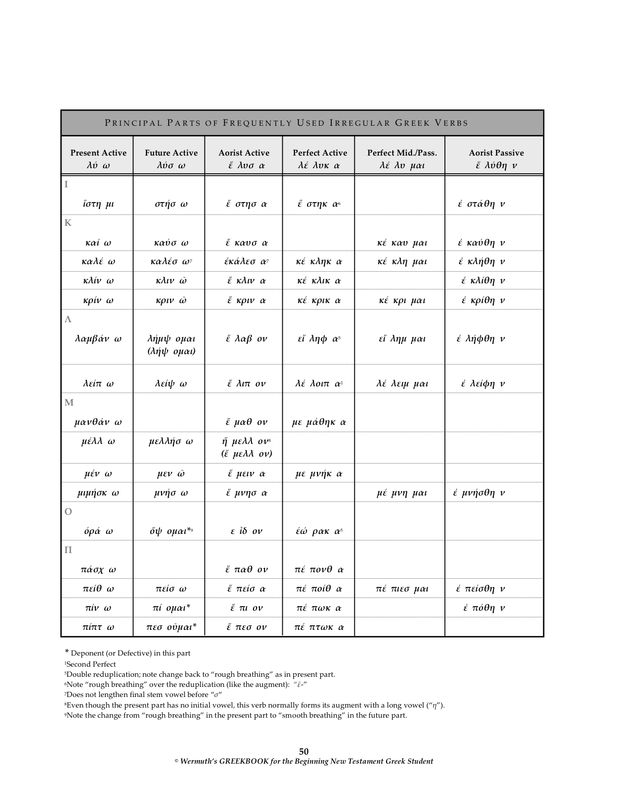 Since most pre-printed vocabulary cards only include the Greek word on the front of the card with the corresponding definition on the back, it’s important to create your own vocabulary cards with an important addition. Even if you use pre-printed cards, adding this additional information is critically important. “What is the additional information?” you may ask. 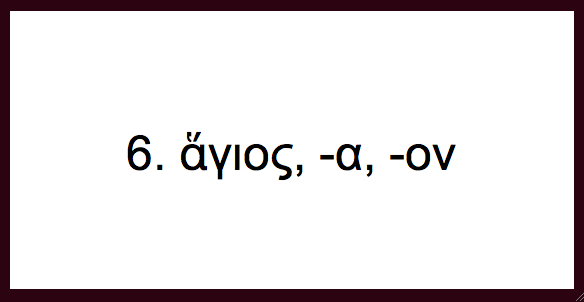 It is simply this: Write the Greek vocabulary word (learning occurs here, too) not only on the front of the vocabulary card, but also on the back of the card—with the definition immediately under it. In this way, you are associating the original Greek word (i.e., the “bell”) with its definition (i.e., the “food”), so that, when you turn the card over to the front side, even though it’s not really there, after repetitive viewings you will actually “see” the definition under the Greek word on the front side of the card as well! In a sense, you can “salivate” all the way through your study of frequently used New Testament Greek vocabulary in gaining a mastery of those words. Try it; it really does work!! 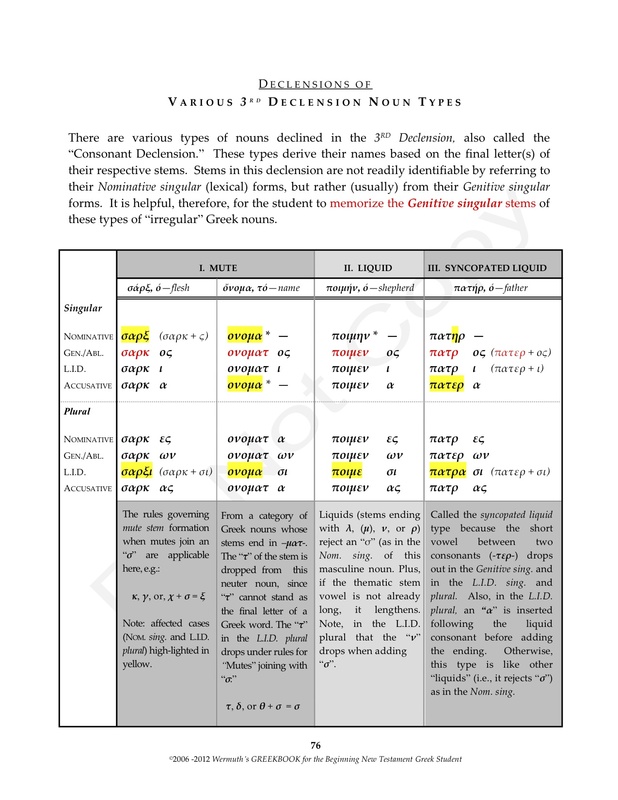 As you grapple with the inherent “irregularities” of Greek 3rd Declension nouns, I would strongly encourage you to be diligent to memorize the 3rd Declension Greek noun endings from this comprehensive nouns chart, just as you would the other two (easier?) 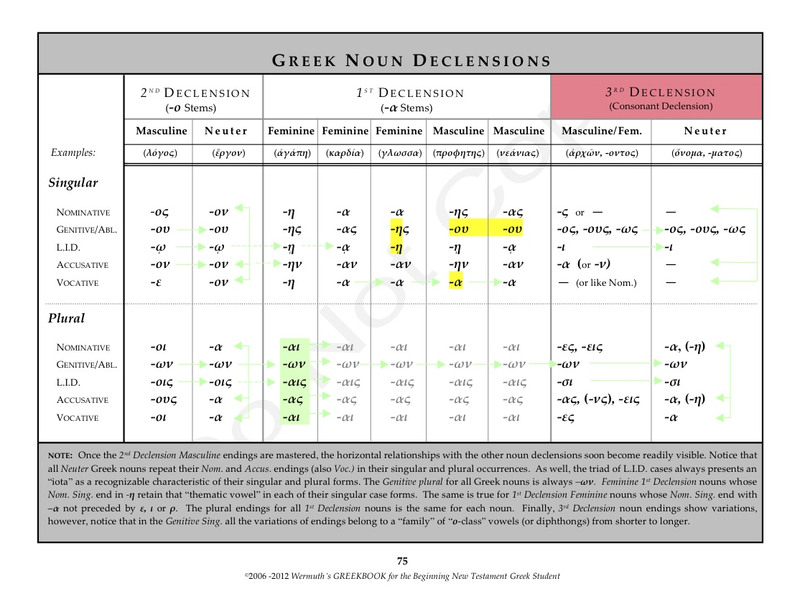 declensions with their various genders and/or variations (i.e., 1st Declension). 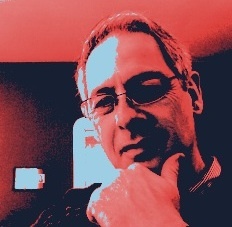 If you will do that, you will find that they are easier to identify in context, and the reasons for their various “irregularities” will be much easier to comprehend. The following discussion and related charts (click for larger, clearer view) should also provide some study help visuals. 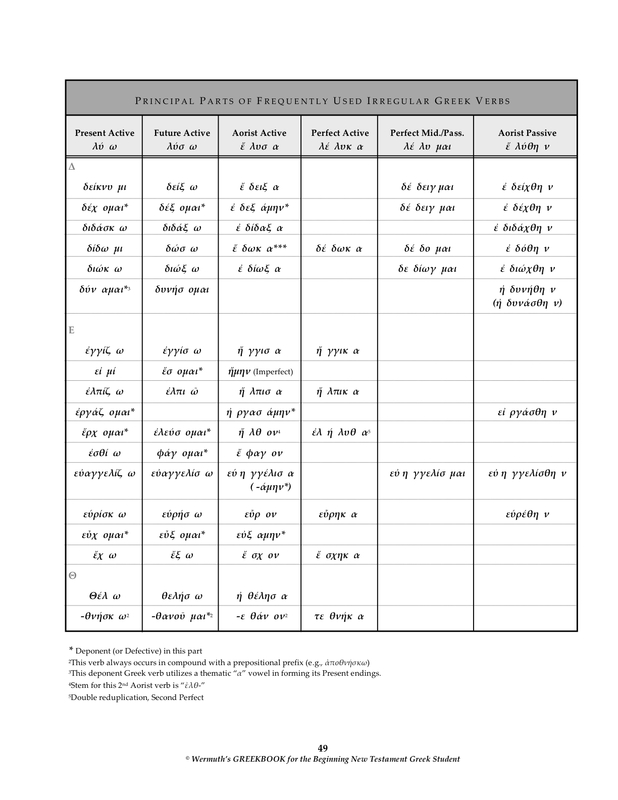 Note: The two pages imaged above discussing and charting the declension of various types of 3rd Declension nouns are also available anytime from the sidebar as a downloadable PDF.